Asia, as the major contributor to the growth of the global refinery coking units industry, accounts for around 40% of the refinery coking unit’s capacity additions from new-build and expansion projects, between 2019 and 2023, according to leading data and analytics company GlobalData. The company’s report: ‘Global Refinery Coking Units Outlook to 2023 – Capacity and Capital Expenditure Outlook with Details of All Operating and Planned Coking Units’ states that up to 1,885 thousand barrels of oil per day (mbd) of coking units capacity will be added globally by 2023 from new-build and expansion projects, taking the total global refinery coking unit capacity to around 11,115 mbd by 2023. Asia also has the highest new-build, and expansion capital expenditure (capex) spending globally with roughly US$13.4 billion (bn) during the 2019–2023 period. Among the countries in this region, China will have the highest new-build and expansion refinery coking unit capacity additions of 318 mbd by 2023. 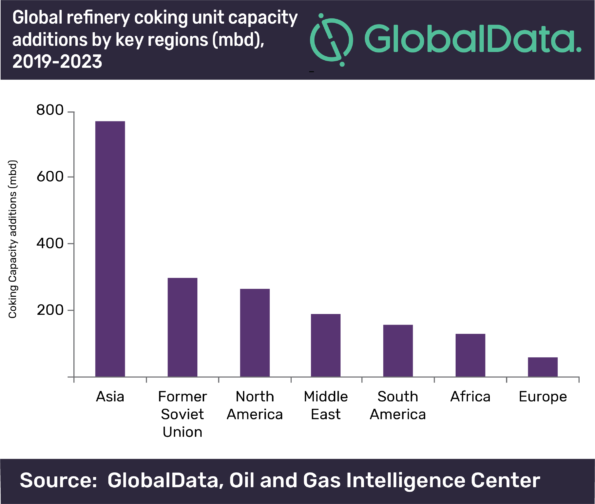 GlobalData identifies the Former Soviet Union as the second highest in terms of refinery coking unit capacity additions. The region will add around 301 mbd of coking unit capacity and has a total capex of around US$5.1bn by 2023. Russia will be the top country in this region with 89% of the region’s total coking unit capacity additions. In terms of capacity, Jieyang refinery in China, Pulau Muara Besar in Brunei and Jizan in Saudi Arabia are the top three new-build refinery coking units for the 2019–2023 period, with capacities of 153 mbd, 114 mbd, and 104 mbd respectively. In terms of capex, Salina Cruz refinery in Mexico, with US$3.6bn, is the top new-build refinery coking unit globally between 2019 and 2023. Salamanca refinery in Mexico follows it with new build capex of around US$2.9bn.